Recently, Chair Mark Harris was in Nashville attending meetings at NASBA which included planning for the upcoming Regional Meetings in Philadelphia and Anchorage. Following one of those meetings, Mark came into my office and in his excited Louisiana dialect said, "Ken, wait until you hear this…..I love it." It seems that during his conversation about a theme for the conferences with staff, one of our most creative young people, Ryan Hirsh, had suggested the phrase "Mission Driven – Member Focused." Like Mark, I immediately recognized its merit, as it succinctly and clearly transitioned from this year's "Back to Our Roots" initiative. The new "Mission Driven – Member Focused" concept is already being implemented in several ways, even before the June meetings. At the Executive Directors' Conference, our Communications Department announced a new program to provide a customized pre formatted high quality Board newsletter for any interested state as a service of NASBA. In early April the first such newsletter for the Kentucky Board of Accountancy was published and distributed. Other states are currently in discussion or have their newsletters in development. In late May, four State Board members, four members of the NASBA Board of Directors, two State Board executive directors and four NASBA staff members will meet in Dallas to begin a new strategic planning process for NASBA involving all of our key stakeholder groups. This transition, from a staff-focused process, will insure that new perspectives, priorities and positions will be considered, implemented and ultimately measured. On June 1, John Johnson will join the NASBA staff in Nashville as Director of Legislative Affairs. This newly created position will provide an enhanced and professional legislative support capability that NASBA can provide to State Boards of Accountancy. Chair Mark Harris has named a new Legislative Affairs Committee, headed by NASBA Director-at-Large Donald Burkett (SC), which will provide guidance and resource management for the new staff position. 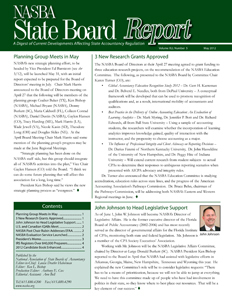 NASBA has seen a large increase in the number of requests from State Boards for legislative support. Already this year NASBA has provided legislative support to Arkansas, Georgia, Maine, New Hampshire, Tennessee and Wyoming. John is a former executive director of the Florida State Board of Accountancy, and for the past six years has served as the Director of Legislative Affairs for the Florida Institute of CPAs. He has a long legislative affairs history which makes him uniquely qualified to provide a high level of services and support to our State Boards. For some time, because of several State Boards' concerns about quality and consistency, NASBA has been asked to consider providing international transcript evaluations. With the recent hiring of an expert foreign transcript evaluator, Brentni Henderson-King, the purchase of an international reference library and the formation of a seasoned team of evaluators with foreign language experience, NASBA will soon be launching this exciting new service in support of our State Boards. At the Washington State Board's recent meeting, it became the first state to sign on to the new service. I hope that all states will look at participating and allowing NASBA to be one of their accepted evaluators. NASBA's International Transcript Evaluation service intends to provide the highest level of quality and assurance, as is mandated by our State Boards of Accountancy. The above mentioned NASBA services are just the beginning of our effort to demonstrate and provide direct support to State Boards. I am certain that following the strategic planning session, and as our Vice President of State Board Relations, Dan Dustin, continues to visit State Boards, we will have a clearer understanding of the needs and expectations of our member boards. We will do our best to meet those needs as your "Mission Driven – Member Focused" association.